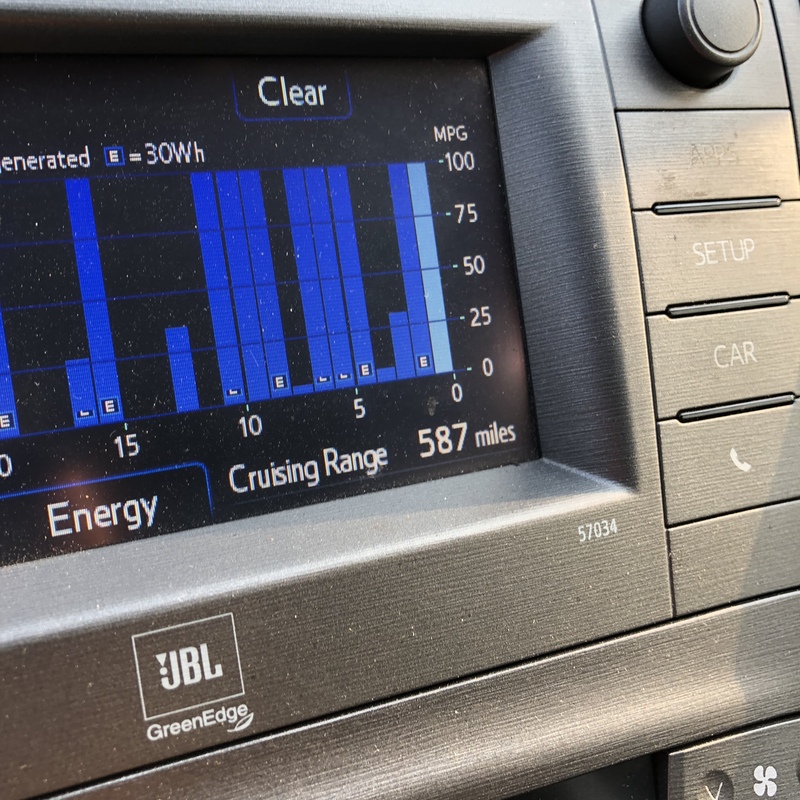 For the past three years, I have watched the Prius’ system reported total cruising range, after a full tank, gradually decrease from ~590 (at the start of ownership in May 2012) to ~480, to ~420 and rock bottom at 385 miles. After performing the above bullet points of maintenance, I’ve seen the total cruising range increase back to 416 from ~385 after filling up a full tank. After changing the motor oil (to 5w-30) and cleaning the intake manifold, throttle body and mass airflow sensor, not only is the Prius hitting the mid 50’s in MPG average fuel efficiency between fill-ups consistently for the first time in at least two years, the total cruising range also jumped to 587 miles, very close to the initial ownership era. Also, the first thing I noticed is that the EV indicator activates with more frequency when I’m cruising at 45 mph or slower. Before, I would had to “ease” the throttle to trigger the EV assist, but after doing the aforementioned additional service, the EV assist just activates with higher frequency. I was literally blown away by this significant jump. This weekend, I will fully service and clean the entire exhaust gas re-circulation (EGR) assembly, including the cooler. I am estimating the entire job will take at least 3-4 hours but I am eager to see what, if any, improvement it has on further increasing the efficiency of the Prius. We’ll be taking the Prius on a road trip to Sonoma County soon, so this will be the perfect time to gauge any improvements, if any.